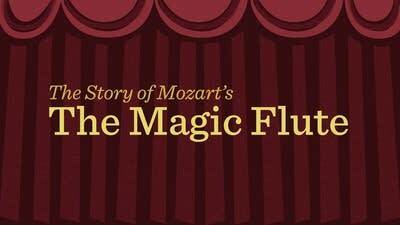 In April 2014, Minnesota Opera presented a two-week run of The Magic Flute at the Ordway Center for the Performing Arts. But what is The Magic Flute all about? A new video from Classical MPR provides a plot summary of the iconic opera. Tamino, a prince, is alone in the woods, fleeing a deadly serpent. He faints but is saved by three ladies who are the attendants of the Queen of the Night. Tamino wakes up and hears someone coming: it's Papageno, a bird catcher. Tamino assumes that it was Papageno who saved him, and the two become friends. The three ladies return and explain that it was they who saved Tamino, and they give him a picture of Pamina, the Queen of the Night's daughter. Tamino falls in love with the portrait, but is told that Pamina has been kidnapped by Sarastro, a high priest. Tamino vows to rescue Pamina. Hearing this, the Queen arrives and offers Tamino her daughter's hand in marriage if he is successful. To aid in their quest, Tamino is given a magic flute and Papageno is given a set of magic bells. Tamino and Papageno are led to Sarastro's temple by three spirits. Papageno scouts ahead; he finds Pamina and he reassures her that she will soon be rescued. Tamino sneaks into the temple and goes in search of Papageno and Pamina. They all run into Sarastro and his followers. It turns out Sarastro is kind and wise, and he insists that Tamino must undergo a series of tests to prove himself worthy of Pamina. With the series of tests about to begin, Sarastro explains that he kidnapped Pamina from her evil mother, the Queen of the Night, because Tamino and Pamina are meant to be together. Papageno is also promised a wife if he successfully completes the trials. In preparation, they must remain silent  Tamino and Papageno are not allowed to speak. Meanwhile, The Queen appears before Pamina and tries to convince her to kill Sarastro. The Queen sings her famous aria, "Der Hölle Rache", which translates as "A hellish rage burns in my heart." But the Queen of the Night's efforts are in vain. Tamino and Pamina meet again, but because he is not allowed to speak, Pamina fears Tamino no longer loves her. The three spirits reassure Pamina that Tamino does indeed love her. Tamino declares he is ready to be tested, and  together with Pamina  faces the trials of water and fire; with the aid of the eponymous magic flute, they are successful. Papageno, meanwhile, plays his magic bells and his destined mate, Papagena, appears. He is filled with joy. Papageno and Papagena sing their signature duet, Allegro: "Pa- pa- pa- ...". The Queen of the Night is angered by everyone's love and success; she returns to destroy the temple ... but she is cast out into the darkness forever.